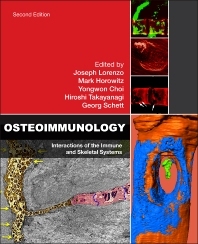 Osteoimmunology: Interactions of the Immune and Skeletal Systems, Second Edition, explores the advancements that have been made in the field during the last 40 years, including valuable information on our understanding of the interactions between hematopoietic, immune, and bone cells, now known as the field of osteoimmunology. This comprehensive work offers the most extensive summaries of research trends in the field and their translation into new therapeutics. Early chapters deal with the development of osteoblasts, osteoclasts, hematopoietic stem cells, T and B-lymphocytes, and communications between these cellular elements, while later sections contain discussions of the signaling pathways by which RANKL influences osteoclast development and function. Subsequent chapters explore the effects that estrogen has on bone and the immune system, the development of pathologic conditions, and the growing research around osteoporosis, Paget’s disease, the genetics of bone disease, and bone cancer metastasis. Early controversies: are osteoclasts capable of bone resorption? Early controversies: hematopoietic or mesenchymal origin of the osteoclast? What happens downstream of TRAF6? Syk kinase: downstream of DAP12/FcRγ? What is the target cell of osteoclast-derived factors that may promote bone formation? How do osteocytes contribute to coupling? Dr. Lorenzo is Professor of medicine in the Division of Endocrinology and Metabolism and Director of Bone Biology Research at the University of Connecticut Health Center. He is a nationally renowned expert on bone remodeling and its effect on bone health. Dr. Horowitz is Professor of Orthopaedics and Rehabilitation at the Yale University School of Medicine. His research interests include the interactions between the skeletal, immune, and hematopoietic systems as they relate to normal and pathologic bone remodeling. Dr. Choi is Professor of Pathology and Laboratory Medicine, University of Pennsylvania; Investigator, The Leonard and Marilyn Abramson Family Cancer Research Institute, Philadelphia, PA.
Dr. Takayanagi is Professor in the Department of Cell Signaling, Tokyo Medical and Dental University. His group studies the mechanism of bone destruction in rheumatoid arthritis, which focuses on the regulation of osteoclasts by T cells. This interdisciplinary field, osteoimmunology, covers various research on shared mechanisms and interactions between immune and bone systems.